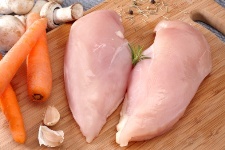 Foodborne illnesses are a real threat any time of the year. But in the summer months, when temperatures start to soar and the humidex rises, the risk of eating contaminated food rises exponentially. Bacteria love to grow in warm weather. In fact, 90 to 110 degrees Fahrenheit is the perfect temperature range for bacteria to multiply. Bacteria also love moisture, so when summer humidity sets in, bacteria are happy to soak it up. If these bacteria happen to be multiplying exponentially on a piece of chicken you left out of the fridge, you could be in for a nasty bout of food poisoning. Fortunately, most of us have strong immune systems and can fend off the bacteria that might be lurking in the foods we’ve exposed to heat and moisture. Others, however, are not so lucky. There are some that have a higher risk for catching a foodborne illness. This group includes those with a compromised immune system, the very young, pregnant women, and seniors. As we get older, a number of changes happen to make our bodies less able to defend against harmful bacteria. Part of this has to do with medications. Conditions like diabetes, cancer, and heart disease can weaken our immune response to pathogens. When this is combined with drug treatments that cause side effects, another blow is dealt to the efficiency of our immune system in being able to protect us. Other changes that occur as we age include a reduction in stomach acid. Stomach acid not only helps break down the foods you eat, it also kills harmful bacteria. Seniors can be low in stomach acid because many are missing key enzymes, vitamins, and minerals. Seniors also fall victim to bouts of acid reflux and will turn to anti-acids for relief. Unfortunately, these over-the-counter meds also lower stomach acid levels. The key to protecting against foodborne illness as a senior is to follow some simple guidelines. Wash your hands often and keep food preparation surfaces clean. Although you’ve likely been admonished to wash your hands since you were a kid, it bears repeating as unwashed hands are a big culprit in the spread of foodborne illness. Use warm soapy water and wash before and after handling food. Avoid cross-contamination—don’t let raw meat touch other foods, especially if these foods are already cooked and ready-to-eat. Wash plates, cutlery, and cutting boards that have come in contact with raw meats. Know your safe temperatures when it comes to cooking meat. Some meats have a minimum requirement in regards to heat and length of time cooked to ensure that all harmful bacteria are killed. Remember to put meats and other foods into the fridge right away if you are not going to be able to cook them. In general, anything that isn’t being cooked needs to be kept cool. Don’t defrost meat all day on the counter during hot weather. Let it defrost slowly in the fridge. Be careful with leftovers. If they’ve been out of the fridge for more than two hours, they may already contain too much harmful bacteria. If the temperature is a scorcher—90 F and above—even leaving the food out for an hour could be risky. You know all these rules—just make sure to continue to follow them. This is especially important now that you are in your senior years. “CDC and Food Safety,” The Centers for Disease Control and Prevention web site; www.cdc.gov, last accessed June 12, 2013. “Foodborne Illness,” MedlinePlus web site; www.nlm.nih.gov, last accessed June 12, 2013. “Foodborne Illness Especially Dangerous for the Vulnerable,” The US Food and Drug Administration web site; www.fda.gov, last accessed June 12, 2013.